Will Nathan MacKinnon join Duchene and Pickard on Team Canada? Last year, Canada dominated the IIHF World Championship en route to a gold medal. This May, they will be heading to Russia to defend their title. Returning to the roster from last year’s championship team will be Colorado Avalanche forward Matt Duchene. Last year, Duchene finished the tournament with four goals and 12 points in 10 games. He is no stranger to the international stage, as this will mark the 25 year old’s fifth trip to the World Championship. He has also captured gold for Canada in both the Olympics and the Spengler Cup. Duchene is coming off of a season in which he lead the Avalanche in scoring, with 59 points in 76 games. He also recorded his first 30-goal season. 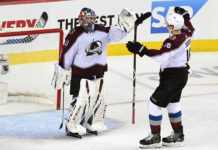 Duchene will not be the only Avalanche that will be suiting up for Team Canada, as backup goaltender Calvin Pickard will also make the trek to Russia. 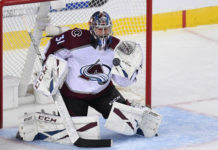 The 24-year-old netminder split last season between the Avalanche and the AHL’s San Antonio Rampage. He played in 20 games for the Avs, posting a goals against average of 2.56 and a save percentage of .922. This will mark his first time representing Canada at the senior level. 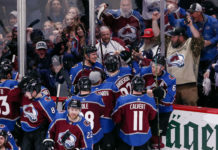 Duchene and Pickard may have some additional company on Canada’s roster as well, as Avalanche general manager Joe Sakic explained that Nathan MacKinnon, who is recovering from a knee injury, may suit up. “If he gets healthy, he’ll go to the World Championships as well,” said Sakic of MacKinnon. Mackinnon was also a member of last year’s gold medal-winning squad, on which he scored nine points in 10 games.